A dog, trapped inside of a Tennessee family's burning home, was saved by a stranger who rushed inside in the nick of time, reported Saturday's WSMV News. Witnesses to the good Samaritan's actions told WSMV News that it was like watching something out of a movie. A man driving a gray Mustang drove up to the burning house on Maxi Jones Road in White House on Saturday evening - the man told stunned onlookers that he "does this for a living," and he proceeded to run into the fire-engulfed house. Moments later, he exited with a dog in his arms. Shortly after the dog was safely outside, the roof of the house fell in - had the dog still been inside, it is likely that his life would have been lost. 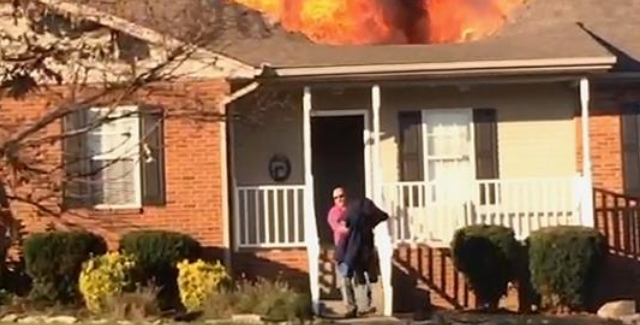 The hero of the day did not stick around - Jimmy Nichols, a keyboard player who witnessed and filmed the fire, told WSMV, "He got in his car and he left; it was so weird, he just took off,"
The family that owns the house was out of town when the fire broke out - investigators do not believe that the fire was suspicious. Three cats that were inside of the home are still unaccounted for. The community told local outlets that they want to be able to thank the stranger. Without his bravery and quick thinking, this family would have lost not only their home, but a beloved family member as well. Responses to "Mystery Hero Rushes Into Burning Home To Save Dog"